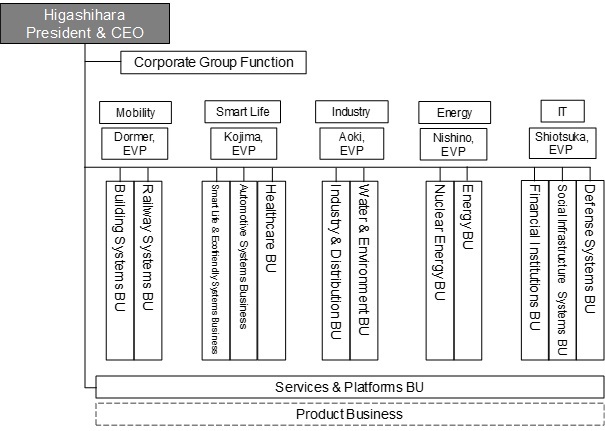 Tokyo, Japan, February 1, 2019 --- Hitachi, Ltd. (TSE:6501, "Hitachi") today announced that on April 1, 2019, it will strengthen its business structures, in order to achieve a transformation into a global leader, as laid out in the 2021 Mid-term Management Plan. Recently, as innovations arise throughout the world using digital technologies, customers are making efforts to change the content of their own businesses, for example by establishing new business models that transcend the boundaries of the industries where they operated in the past. Through its 2021 Mid-term Management Plan, Hitachi will accelerate the Social Innovation Business - which resolves issues faced by society and customers - on a global scale, and put in place social infrastructures that effectively utilize digital technologies. It will strive to become a global leader by focusing on businesses that will grow as a result of innovations and solutions in growth fields in various regions. Defining five growth sectors as (1) Mobility; (2) Smart Life; (3) Industry; (4) Energy; and (5) IT, it will establish an organizational structure that concentrates resources in creating new value and providing solutions. In this way, it will accelerate the creation of innovations in five key sectors, and strive to secure a position as a global leader in each of these fields. "Energy" and "IT" will also serve as platforms for Hitachi. In order to execute the 2021 Mid-term Management Plan and achieve a transformation into a global leader, Hitachi will further promote activities targeting "diversity" as part of its management strategy. It will also promote the appointment of diverse individuals as Executive Officers in regions throughout the world, including non-Japanese and persons from outside of the Hitachi Group. Among the personnel appointments announced today, Hitachi has decided that the Mobility sector will be led by Mr. Alistair Dormer, in the capacity of Executive Vice President and Executive Officer. Mr. Dormer joined the Hitachi Group in 2003, and has been a driving force in the growth of the Railway Systems business as a Vice President and Executive Officer since 2015. Similarly, Mr. Andrew Barr, who joined the Hitachi Group in 2005 and has also contributed to growth in the Railway Systems business, will lead this business in the capacity of Vice President and Executive Officer, and CEO of the Railway Systems Business Unit (BU). Mr. Seiichiro Nukui, who joined Hitachi in 2015, will apply his extensive experience to further the creation of overseas projects in the Industry & Distribution BU, also as Vice President and Executive Officer. These diverse individuals will leverage their respective knowledge and experience to execute their duties in each region, further accelerating the Social Innovation Business on a global scale, and creating new value for society and for customers. The "Smart Life" sector is a key sector that focuses on resolving the issues that people face in their day-to-day lives, and improving their Quality of Life in general. Hitachi's Automotive Systems business is positioned in this sector because it strives to create more comfortable living environment based on a human-centric approach.